Welcome to my blog, Postcards from Brussels. Here you will find posts about Catholic art, culture and liturgy, lives of the saints, pro-life issues, health and well-being, motherhood, family and faith and anything else that might be interesting. This blog is dedicated to Our Lady of Mount Carmel. May she guide and bless every word that is written here, and every reader who visits this site. When we pray to our favourite saints for help and guidance, we understand that we are asking them to intercede for us - to take our prayers directly to God in Heaven. 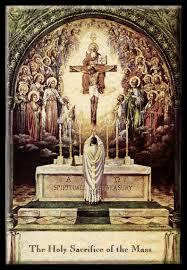 Our Lady is of course the principal intercessor, but all the saints can perform this beautiful act for us. How does it work in practice? Dante encapsulated the medieval idea of the intercession of saints movingly at the beginning of the Inferno, when Our Lady summoned St Lucy, who in turn summoned Dante's beloved Beatrice, who summoned Virgil and appointed him to be Dante's guide. Here we can see it as a sort of divine chain of command - a series of messages and requests passed either up from Earth to Heaven, or in this case, down from Heaven to Earth. 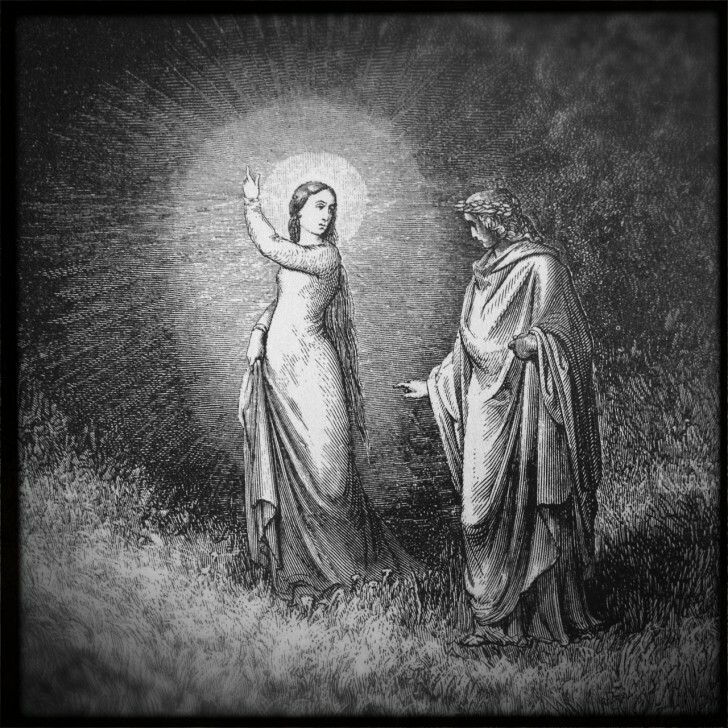 Beatrice summons Virgil. Engraving by Gustave Doré. Rubens, the great Belgian artist of the Counter-Reformation, encapsulated the idea beautifully in a vast altarpiece painted for a Franciscan church in Ghent, which is now in the Musée de Beaux-Arts in Brussels. Its title - The Intercession of Our Lady and St Francis to Avert Divine Wrath - describes well what we see. Royal Museums of Fine Arts, Brussels, 1630s. Our Lord is very much the central figure. He emerges from dark storm clouds, His head surrounded by a fierce light, His red robes billowing like flames of fire, His expression a potent mixture of anger and sorrow. Like a second Zeus, the Saviour holds three thunderbolts high above His head, ready to strike the Earth and its sinful inhabitants with His divine wrath. Our Lady is a picture of tenderness by contrast. She reaches over towards her Son, touching His arm gently with her right hand. Her eyes are filled with tears and her face is pale. She indicates her bared breast, reminding the King of the Universe that it was she who nursed Him as a vulnerable infant, and that now she wishes him to have mercy. Jesus looks down towards the Earth, encircled by sin, represented by the serpent. He sees St Francis leaning over the world, protecting it with his stigmatised hands. St Francis gazes at Our Lord with holy fear and heartfelt, silent entreaty. Seeing his beloved saint and hearing the prayers of His mother, Our Lord’s anger is stilled. The thunderbolts remain motionless, and His left hand hovers over the Earth in a gesture of blessing. In the top right is a rainbow, darkened and partly obscured by the clouds. It serves to reassure us of God’s forgiveness. For now, at least, the world is safe. When Rubens painted this altarpiece in the 1630s, it would have seemed a very powerful and consoling image, for at that time Europe was in turmoil. Less than half a century earlier, Germany and the Low Countries had witnessed the violence and destruction of Calvinist iconoclasts, who vandalized churches, monasteries and cathedrals and drove Catholics out of their homes and cities. Rubens himself was born in a small town in Germany, to which his parents had fled following the riots that raged through their native city of Antwerp. A print showing the destruction in the Church of Our Lady in Antwerp - this was one of the central events of the Bildersturm, or 'statue storm' of iconoclastic fury that swept Germany and the Low Countries in the 16th century. And at the time this painting was completed, the whole of Europe was engulfed in one of the most prolonged and destructive conflicts in history – the Thirty Years’ War. From 1618-48, famine and disease raged through the nations of Europe, and entire regions were destroyed in the fighting. Lawlessness abounded. Mercenaries looted towns and villages, setting fire to everything they could not steal. The message of the painting – that Our Lady and St Francis can avert God’s wrath – would have been compelling to the worshippers at the Franciscan church in Ghent. It encouraged them in their fears and troubles to turn to Our Lady and St Francis in prayer. 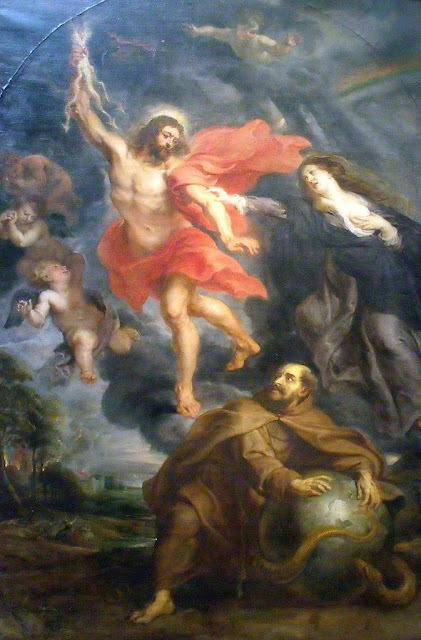 They could see clearly from this large, powerful image, the influence St Francis had in Heaven. The intercession of saints is just as compelling to Catholics today, as we watch what is happening in the world. 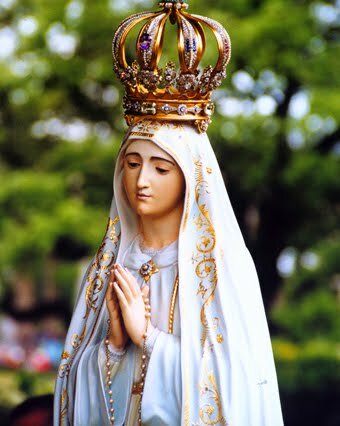 When we place our worries, fears, difficulties, needs and struggles into the hands of our favourite saints, and of Our Lady, we are confident that our prayers will directly reach Heaven. And we know, because Our Lady of Fatima has told us, that if we offer up daily prayer, sacrifices and penance in reparation for the sins by which God is so much offended, we can and will change the world. "Humility," says St. Bernard, "is the foundation and guardian of virtues;" and with reason, for without it no other virtue can exist in a soul. Should she possess all virtues, all will depart when humility is gone. But, on the other hand, as St. Francis de Sales wrote to St. Jane Frances de Chantal, "God so loves humility, that whenever He sees it, He is immediately drawn thither." This beautiful and so necessary virtue was unknown in the world; but the Son of God Himself came on earth to teach it by His Own example, and willed that in that virtue in particular we should endeavor to imitate Him: Learn of Me, because I am meek and humble of heart. Mary, being the first and most perfect disciple of Jesus Christ in the practice of all virtues, was the first also in that of humility, and by it merited to be exalted above all creatures. It was revealed to St. Matilda that the first virtue in which the Blessed Mother particularly exercised herself, from her very childhood, was that of humility. A wise priest recently recommended to me the Litany of Humility, which I am praying every day of Lent. It is tough. At first, I balked. I understand about not being exalted or esteemed, but am I supposed to pray not to be loved? But as I continued, I realised that we are not praying not to be loved, or praised or esteemed - we are praying to be released from the desire of these things. This is the ideal - to be as unaffected by praise as we are by scorn and ridicule. True humility and lack of ego is what we recognise and esteem in holy priests, and it is what characterises all the great saints and makes them so heroic in their imitation of Christ. Apparently, during his recent visit to Mexico, Pope Francis handed out rosaries to children on a hospital ward in Mexico City. One report even stated that he gave a little boy his own personal rosary and asked the boy to pray for him. I was impressed by this, and I wanted to find an image of the incident, but I could not find a single photo on the internet. 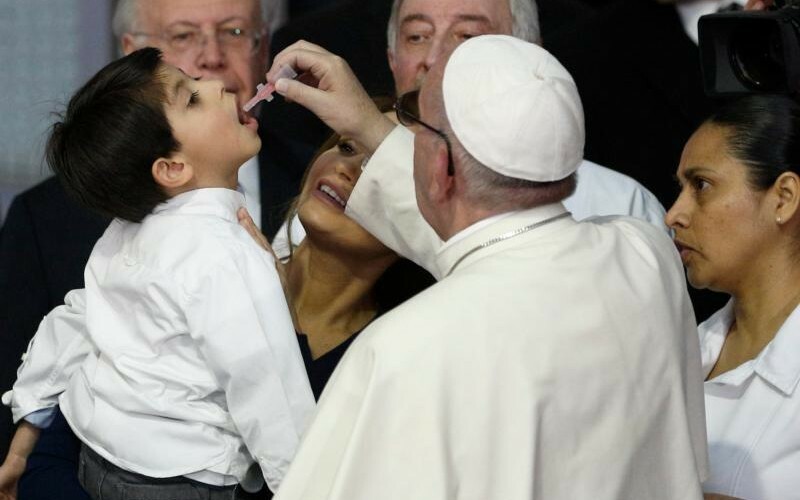 There are lots of pictures of the Pope handing dummies to babies, and a raft of images of a staged incident in which Francis gives a small boy some drops of medicine - actually, a polio vaccine. But no rosaries. It's not exactly a stunning revelation to realise that the World's media are more interested in photographing the Pope giving a vaccine than handing out rosaries, but it reminded me of just how counter-cultural we are, as practising Catholics, when we pray the rosary. In the world's eyes, this string of beads is utter foolishness, superstitious nonsense - particularly in comparison to the wonders of modern medicine. Of course the Church has never denied the efficacy and necessity of science and medicine. St Luke, after all, was a doctor. But what our faith teaches us is that we also need supernatural grace, the grace of God, which is what makes us truly live - not just in this life, but for eternity. What the materialists of the modern era, and indeed the image of the Pope administering medicine, are saying, is that science alone can save us. This reminded me of a painting I saw recently at the National Gallery of London's exhibition of portraits by the Spanish artist Francisco Goya - an artist who wholeheartedly embraced the Enlightenment, and yet who retained up to the end a complicated relationship with his Catholic faith. The work, entitled 'Self Portrait with Doctor Arrieta' was painted in 1820, after the 73-year old artist had recovered from a particularly intense bout of illness. In the portrait, Goya paints himself with ashen face, his eyes almost closed, his mouth half open, leaning back in bed feebly clutching at his bed sheets. One can almost hear the hoarse breathing and see the sweat glistening on his brow. He is held up by his doctor, Eugenio Arrieta, who holds a glass of medicine which he is about to give to his patient. Self Portrait with Dr Arrieta, Goya, 1820. At the bottom of the picture there is an inscription: 'Goya in gratitude to his friend Arrieta: for the compassion and care with which he saved his life during the acute and dangerous illness he suffered towards the end of 1819 in his seventy-third year'. This image is very reminiscent of the traditional ex voto: paintings and other gifts placed on the altars of Our Lady or particular saints in gratitude for prayers answered - babies conceived, illnesses cured and so on. The giving of an ex voto as a kind of thank-you present to the saints was a regular and normal part of Catholic life for centuries. 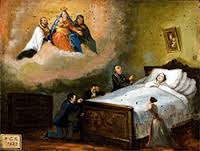 In this 19thc Italian ex-voto image below, a woman lies ill in bed, while the family pray at her bedside. Our Lady and saints in Heaven are shown above, indicating that the prayers were heard and answered. This little painting would have been donated to a particular altar, probably in the local church, in thanksgiving for the woman's recovery. Goya's painting of Dr Arrieta is a deliberate break with tradition - a new, Enlightenment version of the ex voto: here, it is not Our Lady or the saints who are being thanked for the cure, but the good doctor and his medicine. 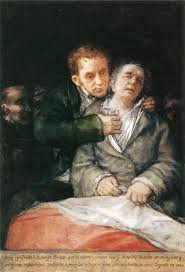 Thoughts of death were preying heavily on Goya's mind at this period of his life as his illness took hold. Just a year earlier, Goya had finished his last religious painting, a beautiful image of 'The Last Communion of St Joseph of Calasanz'. In this work, the dying saint receives his final Communion before he is taken up to Heaven. 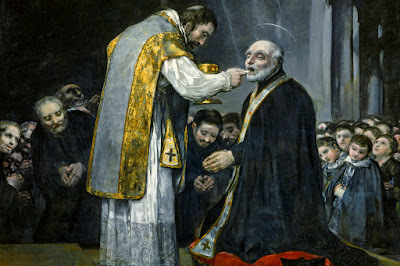 The saint closes his eyes and opens his mouth, a bit like a patient waiting for his medicine, while the priest, like a doctor, places the host on the saint's tongue. The Last Communion of St Joseph of Calasanz, 1819, Goya. In some ways, these two paintings encapsulate a good deal of what was going on in Europe at the time, as the new rationalism of the Enlightenment sought to undermine the ancient certainties of the faith. It is a process that has perhaps reached its peak in our lifetime. Goya was not a regular Mass-goer, but he had faith, and indeed he asked in his will to be buried in a Franciscan habit. Sadly though, he did not have enough belief to request a priest for Communion and the last rites before he died, in April 1828. His image of St Joseph of Calasanz however, leaves us with a beautiful message. When our body finally gives up and when no doctor, however skilled, and no medicine, however strong, can save us, we have the body, blood, soul and divinity of Our Lord Jesus, and it is that which will give us everlasting life. 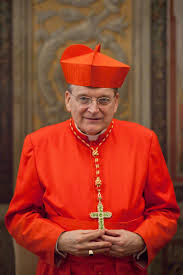 His Eminence Cardinal Burke, during one of his many visits to encourage, enlighten and console orthodox Catholics around the world, visited London in November, at the invitation of the Latin Mass Society. 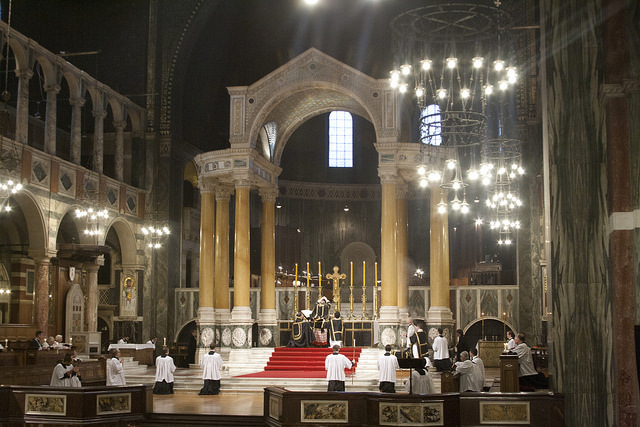 He conferred the sacrament of confirmation in the Traditional Rite to 36 children and adults, and then celebrated a Pontifical Requiem Mass at Westminster Cathedral. Well, the principal means is the sacraments and, above all, the Holy Mass. If one wants to become a saint, one should deepen one's understanding of, and participation, in the sacramental life of the Church. He should make his life liturgical, in the sense of that holiness that we encounter in its perfection in the Mass - in other words, we encounter Jesus Himself, and the whole good of our salvation, in the Mass. 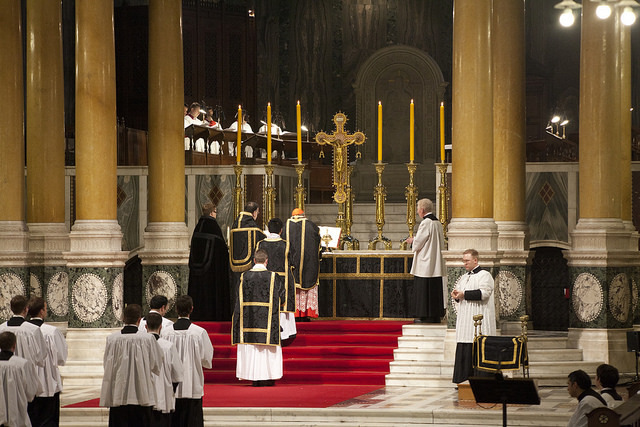 [We are to] carry that with us, as the priest says at the end of Mass, 'Go forth, the Mass is ended'. The focus of our lives should be the Holy Eucharist, and then we bring from it that holiness which should permeate every aspect of our lives. Then, after this comes the prayer life and the devotional life, by which we live continuously the mystery of the faith that we experience in the Holy Mass. So that would be my number one exhortation. My first post is not in fact about a painting from Brussels, but it is about a Belgian artist - the great Catholic painter Pieter Bruegel the Elder, who worked a good deal in Antwerp, visited Rome, and died in Brussels in 1569. This painting, called ‘The Fight Between Carnival and Lent’, was painted in around 1559, and is now in the Kunsthistorisches Museum in Vienna. In this teeming canvas filled with over 200 individual figures, Bruegel sets before us in vivid detail the main square of a Flemish town in the 16th century. It is February, the month of Carnival – carne vale or ‘goodbye to meat’ – and also the month of Lent. The artist has conflated two days of the liturgical calendar – Shrove Tuesday and Ash Wednesday – into one single scene, and the canvas is effectively divided into two parts, so that we see, on the left hand side of the painting, the drunkards and gamblers of the Carnival outside the tavern, and on the right, coming out of the church, the penitents and alms-givers of the first day of Lent. The ‘fight’ of the painting’s title is taking place in the foreground. The two principal combatants are ‘Carnival’ in red trousers on the left, and ‘Lady Lent’, the seated figure in grey on the right. They are grotesque extremes: the ruddy-faced glutton battling the ashen-faced penitent, with their followers snaking behind them on both sides. ‘Carnival’ is a pot-bellied man astride a beer barrel, with a pork chop attached to its front end. His helmet is a game pie and his lance is a spit on which a half-eaten suckling pig is skewered, together with other pieces of meat and a dangling sausage. Around his waist hangs a large butcher’s knife: by this time butchers had slaughtered all the livestock they were not keeping over winter and consequently meat was plentiful. At the beginning of Lent they closed their shops and travelled to the countryside to purchase new livestock for Spring, so this is very much the butcher’s last hurrah. Behind him is a motley group of masked villagers, playing music and carrying food associated with this time of year – a necklace of eggs, a large wooden platter of waffles, cakes and biscuits. All around them are symbols of vice. A man plays dice with a sinister masked figure in black in the bottom left-hand corner. Playing cards are scattered on the ground, and drunkards leer out of the windows of the tavern watching a makeshift production of a play called ‘The Dirty Bride’. Meanwhile, a group of beggars and cripples on crutches gaze at the scene, ignored by everyone. On the right side of the painting is the emaciated figure of Lady Lent – a man dressed as a woman, probably as a nun. She wears a beehive on her head, symbolizing the Church, and her lance is a wooden oven peel with two Lenten herrings balancing on top. Her cart is pulled by a monk and a nun, and her followers – some of whom are beating their breasts – carry dry bread and pretzels, traditional Lenten fare. Lady Lent carries a bundle of twigs, a symbol of penitence. Behind them is another group of beggars and cripples. In contrast to their fellows on the left, these unfortunates are being attended to by well-dressed men and women who dig deep into their purses for money, and by nuns who hand out food and blessings. The alms-givers have just emerged from the Ash Wednesday Mass. Behind them, through the wide door of the church, we see veiled statues and a priest hearing confession, his hand raised in the blessing of absolution. In the centre of the painting is a large square well, surrounded by a group of village women preparing fish for Lent. The well – a symbol of the well-spring of God’s love – stands at the heart of the village, but is ignored by the Carnival-goers on the left. They are oblivious to the fact that Lent has begun: none of them acknowledges that the time of feasting and self-indulgence they have enjoyed must necessarily give way to a period of prayer and penitence: carne vale implies not only goodbye to meat, but farewell to the flesh. Far from turning away from it however, they remain absorbed in their world of debauchery. Bruegel makes a subtle but direct comparison between the drunken figure vomiting out of the top floor window of the tavern (below), with a kneeling figure receiving absolution in the church. Self-abandonment to worldly desires is contrasted with self-examination and a commitment to the path of salvation. As always with Bruegel, there is a mystery at the heart of the painting, and it lies with the two figures in the centre of the canvas, the man and woman with their backs to us, who are being led along a path by a fool in a green, yellow and red costume. It is impossible to tell whether the couple will turn to the left – towards the tavern, vice and oblivion – or to the right – towards a true preparation of body, mind and soul for the death and resurrection of the Saviour of the World. It is clear that the fool wishes to lead the couple towards the tavern – this is the easy path, illuminated by a blazing torch. But which path will they take? That is the real question of this painting, and of the lives of Catholics – as much today as in the time of Bruegel. Lent is here, and there are so many things to think about in order to be ready for the great penitential season. And how many times should we go to confession? Once a week during Lent? Perhaps that's not a bad idea. I read about this suggestion from St Josemaria Escriva, who was a great teacher of how to sanctify even the smallest and seemingly most insignificant moments of our day. He suggests we should get up out of bed the MINUTE the alarm goes off, rather than hitting the snooze button and rolling over for another 5 minutes of sleep. We offer up this sacrifice to God, he says, and this small mortification will strengthen us throughout the day in our resolution on the path of perfection. I think I shall try... and I emphasise try... to do this during Lent! The heroic minute: here you have a mortification that strengthens your will and does no harm to your body. If, with God’s help, you conquer yourself, you will be well ahead for the rest of the day. It’s so discouraging to find oneself beaten at the first skirmish.